Dear readers, I am now departing the UK for St Jean Pied de Port in south-west France which will be the starting point for my pilgrimage to Santiago de Compostela, a journey of around 800km. I think this will take me around six weeks as I also plan to walk a further 100km to Finisterre. As timing goes it is not great from the Paddy blog perspective as it occurs just at the time the wonderful Broken Road is published (I have a preview copy and can assure you that you will enjoy it! ), However, from a personal perspective this is the time to go on such a journey. Whilst I am away I have a stand-in editor who will try to work on the blog if time permits. I can’t promise anything except that I look forward to getting everything up to date upon my return. I wish you all health and happiness, and that you get a copy of The Broken Road as soon as you can. This entry was posted in Uncategorized on September 6, 2013 by proverbs6to10. ULTREIA, SUSEIA, SANTIAGO, as pilgrims used to shout meaning “go further, for Saint James is up there”. Santiago, thank you so much. I have returned from a great experience and adventure and I loved Spain, in particular Galicia. This Camino, or any other, is something that those who can should try to experience. I did wonder why Paddy had not undertaken it. I guess it lacks the element of the free spirit, but he certainly had the time. Enjoy the Way…it is a gift that keeps giving of a sort unusual these days. I had an arduous 85 days walk earlier this year through rain, snow and mud from Arles to Santiago – you probably won’t experience such difficulties on the French Rd. Sean, I remember you saying that you were undertaking the journey. Can you believe I had just three days when it rained during five weeks of walking, and of those just a few hours in all? A truly great experience and one I shall repeat somehow. Andre, thank you. It is truly wonderful. Don’t delay! I find God is always more “immediate” when traveling. May you experience His presence on the road. 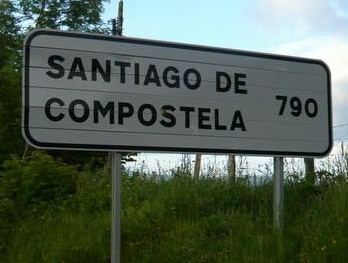 Good luck Tom – I was in Cantabria in August and saw many pilgrims on the Camino Norte. Travel well and follow the scallop shell! Buen Camino , amigo , vaya con Dios . Thank you Blake. I am safely returned and had a wonderful experience. If you can do it, or a shorter part, or even another shorter Camino (and there are many) do try. You will not regret it. Gerald – I believe it is for March – see Washington Post article that I will publish soon. Have a great and safe trip. Perhaps you will tell us about your journey when you return.